Given the vast array of equipment available both online and at specialist shops on the high street, you could be forgiven for thinking that rather than wearing nothing more than shirt, shorts, socks and a pair of shoes, the modern runner should resemble nothing less than a US Navy Seal. There are watches, water bottles, pedometers, heart-rate monitors, MP3 players, sunglasses. And for parents who are always complaining that junior has them run off their feet, there are even specialist strollers that mean that when it’s time to hit the road, baby can come, too. But let’s restrict ourselves to the more common items. The function of a pedometer, as the name suggests is to count the number of steps taken. From here, the distance covered can be calculated along with the calories burnt by inputting stride length. Some models even incorporate a panic alarm that will come in useful for solo runners who suddenly find themselves in an unpleasant situation. While a pedometer may or may not be deemed as particularly useful once you are well into your programme, they can help beginners who start off by walking and want some indication of the distance they are comfortably capable of covering. Many sports watches now incorporate both a stopwatch facility and a heart-rate monitor. The former can be useful, for example, when training on a track when it can allow you both to see your overall time and how long you are taking for each individual lap. A heart-rate monitor tracks how your body is performing. Many have the facility to download the information onto a PC so that a continuous record can be kept for ease of reference. 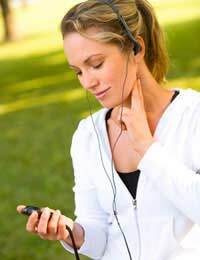 Both beginners and experienced runners find monitors useful because they can not only see how they are responding to exercise but also set the monitor to a certain level, say seventy per cent of the maximum rate, to ensure that they don’t put too much strain on their heart in order to go too quickly, too soon. Hydration is an important aspect of running, irrespective of whether the sun is beating down at noon or there is a chill in the air. If it is cold, the chances are you will be wearing more layers, and more layers mean more perspiration – this, in turn, means that it is as essential to be replacing lost liquid as it is on a hot day. There are a range of bottles available, either hand-held or worn as part of a belt. Hand-helds come in a range of ergonomic designs and prices, but it is advisable to find one that has a hand strap – this will mean that you won’t have to worry about keeping hold of it, and your arm won’t ache from the effort. The problem with belts is that they can be a distraction – either they are too tight or too loose, leading to movement around the waist – so it is important to ask questions before you buy and try out the belt both for comfort and ease of access to the bottle. Many cross-country and trail runners invest in a hydration pack that is worn like a back-pack but contains liquid that can be drunk by means of a tube. With all this equipment, there is a huge amount of choice and prices vary depending on the number of features incorporated into an individual item. With sunglasses, for example, sports models follow the same principle as regular pairs – designer labels cost more. The best advice is to ask fellow runners, decide what your budget is and shop accordingly. Don’t be tempted to try to cut costs – you want the most efficient and durable model that your money can buy.